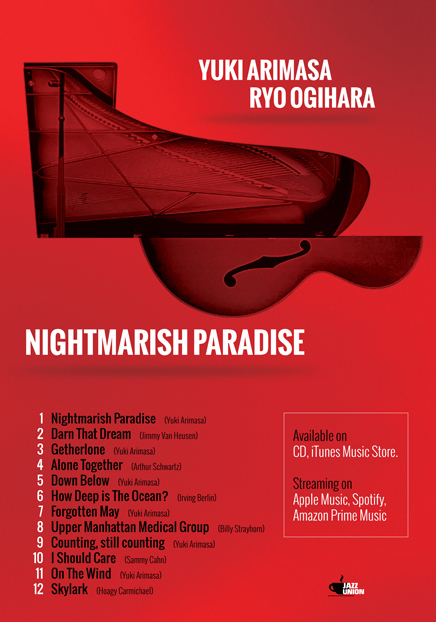 The new release, “Nightmarish Paradise” is a duo album with a guitarist, Ryo Ogihara. We came up with the concept of playing standard tunes through accompanying original tunes. Each standard tune has its own siblings , which is an original tune based on the impression of that standard tunes that follows. By recording those set of tunes successively, we found new essence of the often played standard tunes. Please check out on amazon, or enjoy it by streaming through iTunes, Apple Music, Google Play, or Amazon MP3!